Hello everyone... Today is May Bank Holiday... and the weather is so lovely... The sun shines brightly... the sky is blue and the birds singing happily.... everyones in their t-shirt and enjoying the weather.... the summer is here? Pour water into a steamer and on the heat. Meanwhile, in a mixing bowl whisk eggs with sugar until fluffy. Add yogurt, cooking oil and vanilla essence, whisk again. Then add the sifted flour and baking powder together and whisk evenly. 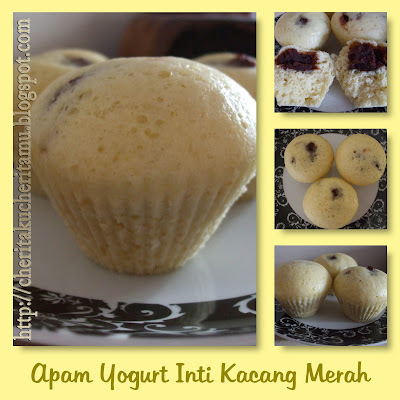 Spoon into apam's casings or you can use ramekins if you have.